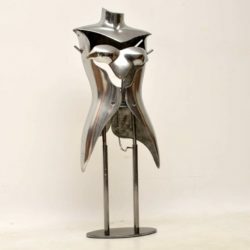 An amazing one of a kind sculpture by contemporary British artist Mo Gardner. 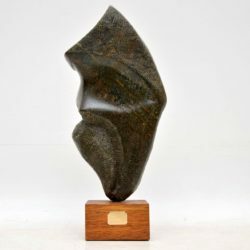 This is made from one solid piece of stone, looks like limestone or marble, with a green/brown hue. 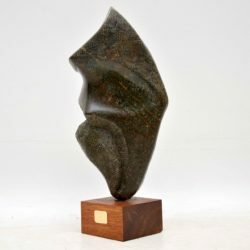 It’s mounted on a wooden base with a brass plaque showing the artists name and date it was made; it’s titled ‘Warrior’ and it dates from 1994. The condition is superb, this is very heavy for its size. 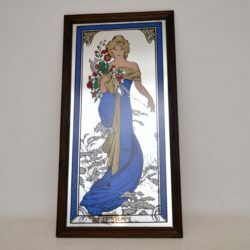 A beautiful vintage french mirrored print in Art Nouveau style, this dates from the 1960’s. 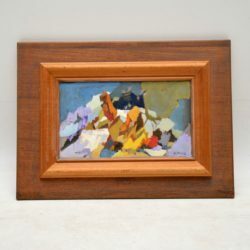 This has a lovely wooden frame, it’s in great vintage condition overall. 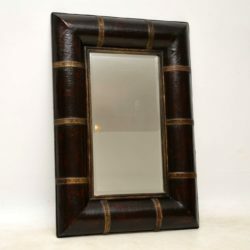 The mirror is nicely aged and is a little distressed here and there, this has a beautiful subject, lovely colours and is beautifully executed. 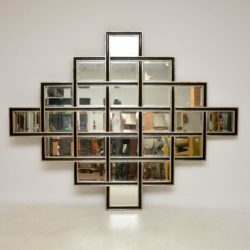 An absolutely stunning and very large mirror, made by the high end manufacturer Harrison & Gil. This is extremely impressive, very high quality, and in great original condition; it dates from around the 1980-90’s. Each section of glass is bevelled, there are no chips or cracks, the frame has a distressed paint finish as was intended with the design. This has multiple hooks on the back so can be hung horizontally or vertically, the Harrison and Gil makers label is still seen on the back. 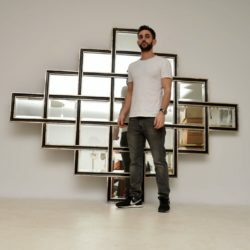 I am shown for scale and display purposes only, and am not included in the price. 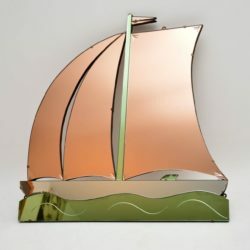 An absolutely stunning and very unusual vintage Art Deco period mirror in the shape of a boat, this dates from the 1920-30's. It's in excellent original condition, with just some incredibly minor wear to the silvered backing on one or two edges. The glass is all clean and free from damage; there are peach, green and clear glass mirrored surfaces, some are etched for decoration. This has three brackets attached for this to be screwed to a wall. 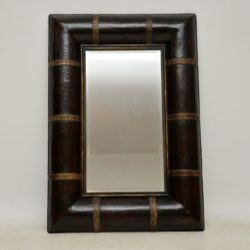 A large and impressive mirror, beautifully made and bound in leather, with gilt wood accents. This dates from the late 20th century, probably 1980-90’s. 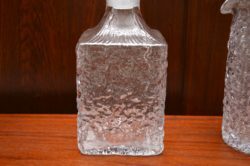 It’s in excellent condition with only some minor surface wear, and it’s of very good quality with bevelled glass. 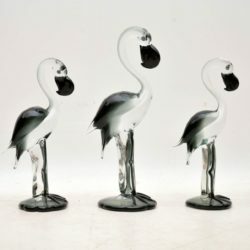 A beautiful and impressive set of three glass flamingos, these are of a good size and are extremely well made. They date from the 1960-70’s, and are all in superb condition, with no damage to be seen. A beautiful original painting by Austin Ruddy, the artist is more well known for his landscape paintings, so this is slightly unusual to see. 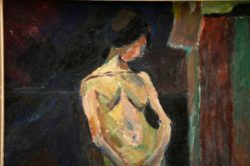 It’s a really beautiful piece, in excellent condition, signed by the artist on the back of the board. 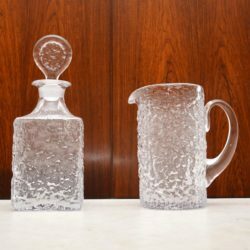 A stunning vintage glass decanter and jug set by Whitefriars, these were designed by Geoffrey Baxter for the textured Bark range in the 1960's. They are extremely well made and in superb condition, with no damage to be seen. 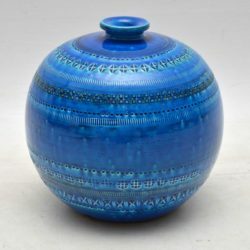 A stunning vintage ceramic vase designed by Aldo Londi for Bitossi, this was made in Italy in the 1960's. 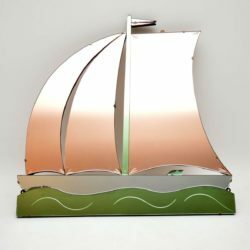 This is a large and impressive model, with the most exquisite patterns and colours. The condition is superb with no damage, the makers marks is seen under the base. 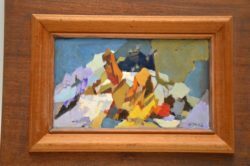 A beautiful oil painting by the renowned British artist Hugh Micklem (1918 – 2009) , this is titled ‘Alpine Dream’ and is dated 2002, towards the end of his life. 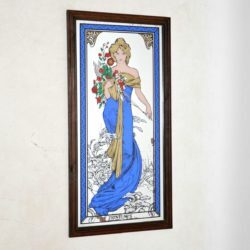 It’s is beautifully executed and is in great condition, the frame is also in good condition. 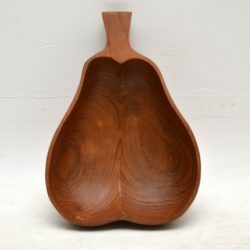 A beautiful vintage fruit bowl carved from one piece of solid wood, in the shape of a pear, this dates from around the 1960-70’s. 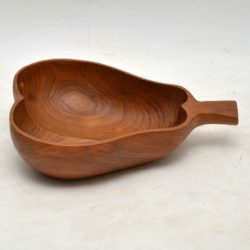 It looks like walnut, though it might be Pear wood, that would make sense given the shape! It’s extremely well made and in great vintage condition, with only some extremely minor wear. 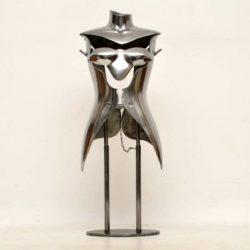 This stunning aluminium & steel mannequin was designed & executed by Nigel Coates in 1993 for Jigsaw of Knightsbridge. They were a limited amount made for Jigsaw, we only have one of these smaller versions. 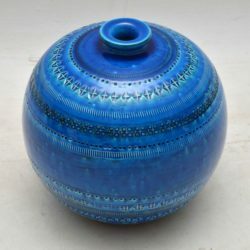 We have a few of the larger ones for sale, but they are a limited edition so we can’t repeat them once they have been sold. They are great props & they can be useful too. 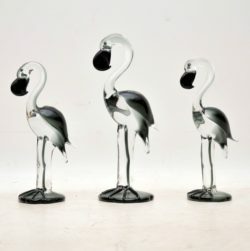 They would also be great turned into lamp stands. This are in good clean condition, with some minor wear to be seen here and there. The body lifts off the base and the height can be adjusted.